I just had a fantastic weekend attending a card/scrap retreat with my best friend. We made quite a few cards and met a great group people, I can't wait to do it again. This is one of the cards I made in my 'free time' while I was away, I am going to put in in the WMC #77 Challenge, Woodland Animals. Super duper cute Tracy! 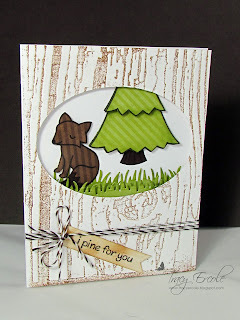 Loving the oval cut out and the woodgrain background! This is adorable. 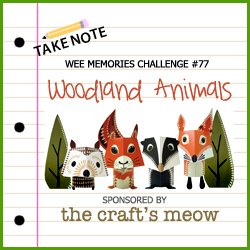 So glad you joined us at Wee Memories. so so cute...Great take on the challenge.. I love how you have highlighted your little scene in the window with the woodgrain! This is a very creative card...love this a lot!